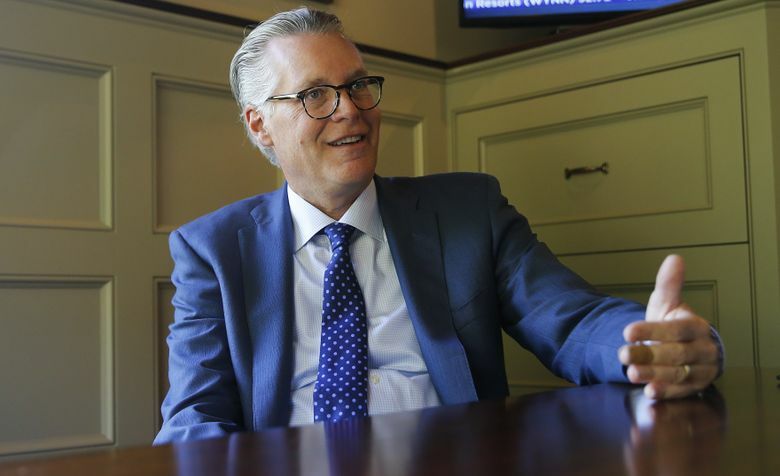 As Delta’s Ed Bastian reaches his anniversary as CEO this month, aviation experts and former regulators say they see signs that the Atlanta-based airline is stepping away from an in-your-face posture that sometimes rankled competitors and annoyed regulators. The cruelty of U.S. airlines has lately become a sore point for travelers — use strong-arm tactics on customers today, and an airline risks a swift explosion of online outrage. Within the industry, however, Delta Air Lines has spent the past year trying to shake a less-visible reputation as a bruising antagonist that fought with other airlines and bureaucrats alike. As Delta’s Ed Bastian reaches his first anniversary as chief executive officer this month, aviation experts and former regulators say they see signs that the Atlanta-based airline is stepping away from an in-your-face posture that sometimes rankled competitors and annoyed bureaucrats under former boss Richard Anderson. Career: Served as Delta’s president from 2007 to May 2016; CEO of Northwest Airlines from 2008 to 2009. Previously was chief financial officer of Delta from 2005 to 2008. Take, for example, the time in 2014 when Atlanta business leaders were considering a state tax increase for roads and Anderson goaded them not to be “chicken” about supporting it. Or the February 2015 CNN interview in which Anderson brought up the Sept. 11 terror attacks while discussing U.S. carriers’ long-standing policy disputes with Persian Gulf airlines, which prompted a public apology from Delta. And there was a parting shot during Anderson’s final days as CEO last May. Delta withdrew future corporate funding for Atlanta’s historic Fox Theatre because the venue hosted a party featuring a performance by Jennifer Lopez at which archrival Qatar Airways celebrated a new route. Delta proclaimed itself surprised and disappointed by the event. The spats ran the gamut — with the government about alliances and landing slots, with lobbyists about whether its interests were being served, even with its own allies in the airline industry. A once-close relationship with Alaska Air Group began unraveling in 2012 as Delta moved to build a hub in the smaller carrier’s Seattle hometown. The partnership between Delta and Alaska was set to end May 1. Bastian, 59, a CPA who earlier in his career worked with food companies, has been repairing a strained relationship with fellow SkyTeam alliance member Korean Airlines. When the U.S. government insisted that Delta give up some flights to Mexico City to win approval for an alliance with Aeromexico, Bastian complied instead of taking the DOT to court, as Anderson did in a 2015 dispute. And when rival United Airlines inflamed the public’s anger against the industry in April by dragging a passenger off a plane, Bastian raised the amount Delta may offer bumped fliers to almost $10,000 — about two weeks before United took similar action. Many regulators saw Delta as the “smartest guys on the block” who ran the best airline, said Paul Gretch, a former head of the Transportation Department’s Office of International Aviation. Yet that success exposed some “pretty sharp edges,” he said, that could feel personal for officials working on Delta cases. According to Delta, which didn’t make Bastian or Anderson available for an interview, its persistence has paid off. The carrier’s 18 percent operating-profit margin — earnings before interest and taxes in this case — last year topped those of American, at 13 percent, and United Continental, at 12 percent. Its shares, which closed as low as $3.93 in 2009, have risen to about $48, and it enjoys more labor peace than most big rivals. Under both CEOs, Delta has found itself the odd one out on some significant government and industry decisions. Industry insiders debate whether the airline’s hardball style has contributed to the disappointments. For instance, when Delta couldn’t get the chief lobbying group for U.S. carriers, Airlines for America, to see its way on certain issues, it pulled its membership and $5 million in annual dues. When Anderson retired, Delta lost a seat on the board of the International Air Transport Association, as the selection committee passed over Bastian for a leader from Hawaiian Airlines — with just 6 percent of Delta’s annual revenue. Delta didn’t directly respond to a reporter’s question about its loss of the board seat. Under Bastian, Delta has been re-establishing links with Korean Air, with which it had a longtime rift and little collaboration. The airlines just agreed to cooperate on routes across the Pacific, in a deal that would give Delta a much needed partner in Asia. Paula Reynolds, former CEO of Seattle-based Safeco before it was acquired in 2008, observed Bastian’s ascent while she served on the airline’s board for a decade. She’s been struck by his willingness to show humility in the year since he became CEO. She admired his tone in flight-safety videos talking about the honor he feels to be among Delta’s 80,000 workers, as well as his public apologies after Delta canceled thousands of flights after Atlanta storms in April and an IT meltdown last summer. “He’s got a graciousness about him — he’s humble,” said Reynolds, who left the board in 2015. As for consultant Garfinkle, he credits Delta for giving up some flights to Mexico City in the Aeromexico case rather than taking the DOT to court, as the company did in a 2015 dispute over a Seattle-to-Tokyo route.